Stock markets are back in rally mode following the US and Italian election results. I believe this is the final "blow off" phase to a market top which could peak at any stage between now and March 2017. 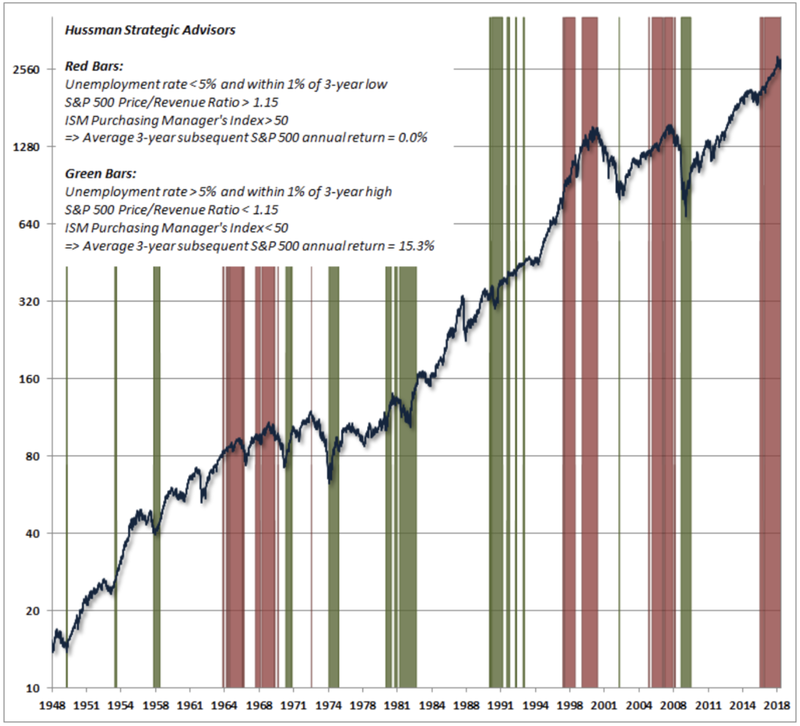 Stock market valuations have once again reached an extreme only experienced in 1929, 1972, 1987, 2000 and 2007. Donald Trump's election success has been compared to that of Ronald Reagan who won the race to the White House in November 1980. Following Reagan's win, the S&P 500 rallied +14% in just a few weeks but topped out in November 1980 and then tumbled -22% over the next year. That was when stocks were trading at single digit P/E multiples. Today, they are four times more expensive. Government bond yields are rising, particularly in the US where Trump's policies will be viewed as potentially quite inflationary. US Treasuries have declined -8% since the US election result. Eurozone government bonds have held up better, falling just -4% during the recent Trump-inspired inflation scare (but -7% since August). 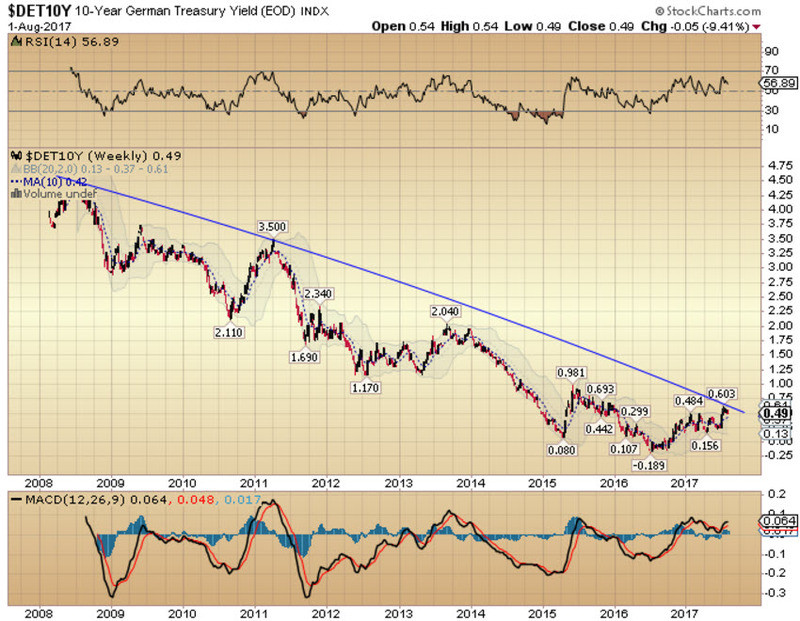 Euro government bonds have now reached an oversold extreme and I expect a rally in EU government bond markets to get underway shortly, likely coinciding with a top in equity markets. While the Federal Reserve has backed away from its position as lender of last resort, the ECB continues to buy everything not nailed down and has recently extended its QE programme to December 2017. Gold has also declined recently in tandem with other safe haven assets. 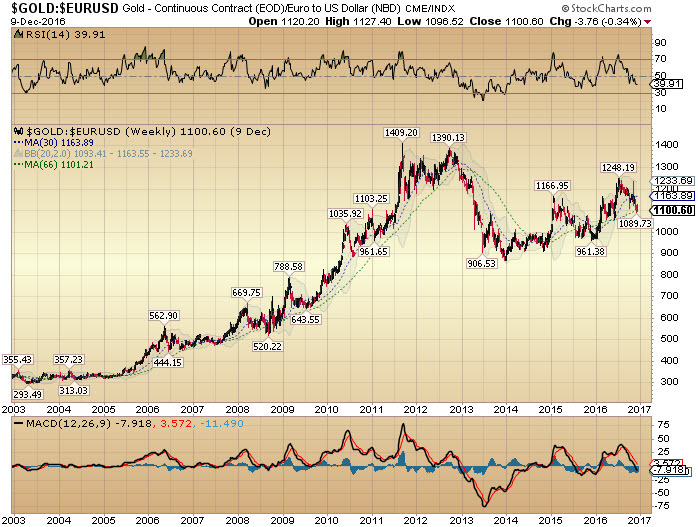 Despite the recent correction however, gold priced in euros has still rallied +12% year-to-date. 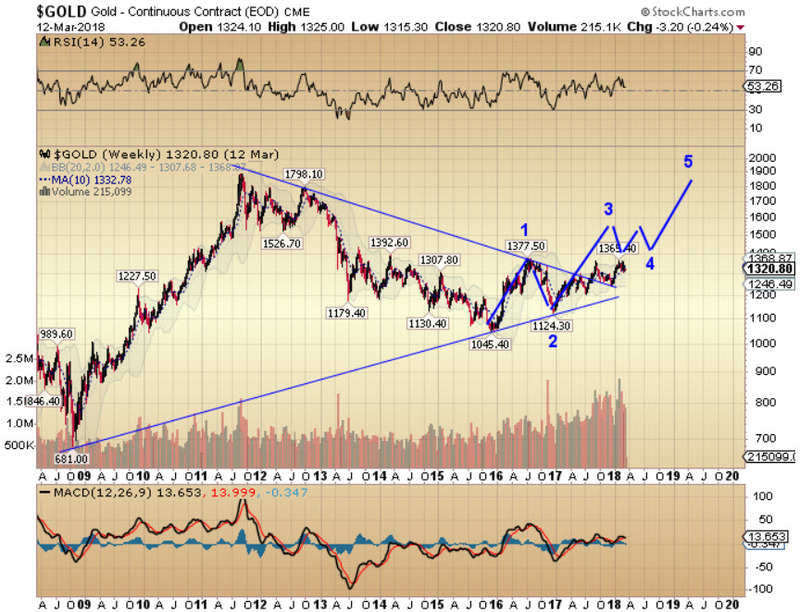 Based on my reading of the gold cycles, we are getting very close to the end of the current investor cycle for gold and I expect a turn higher shortly, possibly coinciding with an interest rate hike by the Federal Reserve on December 14th. I remain defensively positioned for now with 20% equities / 40% bonds / 30% precious metals / 10% cash. Trump's election victory has led to an +4% rally in the USD, an +8% rally in US stocks and an -8% drop in 30-year US Treasuries. 30-year Treasury yields jumped 50 basis points from 2.6% to 3.1% over the last four weeks. More broadly, global stock markets have added +5% in Euros, Eurozone government bonds have declined -4% and gold in euros has fallen -5%. What was initially considered bad news for investors ahead of the US election transformed into good news, literally overnight. The Active Asset Allocator lost -2.2% in November but has returned +8.4% year-to-date. In this Investor Update, I review the short-term impact of the Trump effect on equities, bonds, currencies and precious metals and examine what may be in store for investors in 2017. Will a Trump presidency make America great again? He has promised tax cuts, infrastructure spending and regulatory reform, all of which could boost US GDP over the next two years, but at a significant cost of ballooning government debts and budget deficits. His protectionist policies on trade and immigration will negate the aforementioned positives to a certain degree. Of course this is all speculation for now as Trump and his team have yet to execute on their plan. Let's take a closer look at some of Trump's proposed policies and their likely potential impact. The headline rate of corporation tax in the US is 35%. However, the average tax rate of the largest 50 companies in the S&P 500 is just 24%. So, stock markets may be overestimating the positive impact of Trump's tax reform plan. On infrastructure spending, Trump is planning to spend $100 billion/year on much-needed repairs to America's transportation network. Spending billions of dollars on America's rail infrastructure, roads, bridges and tunnels makes sense and should provide a timely boost to US GDP growth. However, the Trump team must execute. The Obama administration attempted a similar strategy in 2009 in the midst of the Great Financial Crisis. "The American Recovery and Reinvestment Act of 2009" was put in place at a cost of $800 billion to save and create jobs and invest in infrastructure, education, health, and renewable energy. The impact on job creation and GDP growth was considered relatively modest in the following years. Asset prices benefitted handsomely of course but this was largely a result of four rounds of quantitative easing rather than Obama's fiscal policy decisions. Many are comparing Trump's recent victory to that of Ronald Reagan who won the race to the White House in November 1980. Reagan beat incumbent President Jimmy Carter on a platform of policies quite similar to those now being proposed by Donald Trump. Following Reagan's election victory, the S&P 500 took off (see chart below) rallying +14% in just a few weeks (compared to just +8% so far since Trump's win). However, that was it for the stock market rally back then. Stocks topped in November 1980 and then dropped -22% over the next 12 months. That was when stock market valuations were trading at single digit P/E multiples. Today, stocks are four times more expensive. Back in 1980, the US national debt amounted to $908 billion and US GDP was $2.86 trillion (32% debt/GDP). Today, the US national debt is $19.6 trillion while US GDP is only $18.7 trillion (105% debt/GDP). It is going to be much more difficult for the Trump administration to grow the US economy by more than 2%/year during his time in Office. So far, the stock market has given Trump the benefit of the doubt, but I can't help but feel that 2017 is shaping up to be quite a different proposition, for reasons I will explain next. The Dow Jones Industrials Average is a price-weighted index of 30 of America's largest publicly quoted companies including many household names like Disney, JP Morgan, Caterpillar, MacDonalds, Proctor & Gamble, Exxon Mobil and Goldman Sachs. Following the Great Financial Crisis of 2008, the Dow kicked off a new bull market, fueled to a large degree by central bank money printing on a scale never before witnessed. 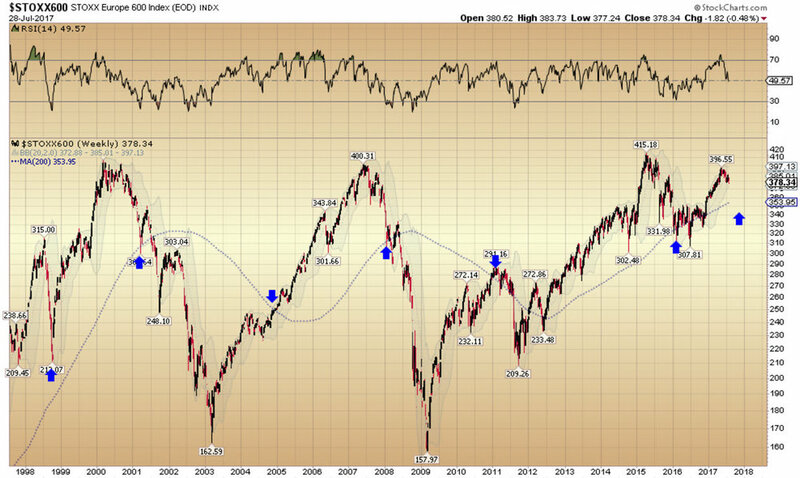 The rise over the next 9 years has been a sight to behold - a triple from those March 2009 lows. Times have changed however. QE has ended in the US, bond yields have rallied 100 basis points and the USD has added +10% versus the Euro since May 2016. US corporations are facing multiple headwinds at a time when corporate earnings are declining. 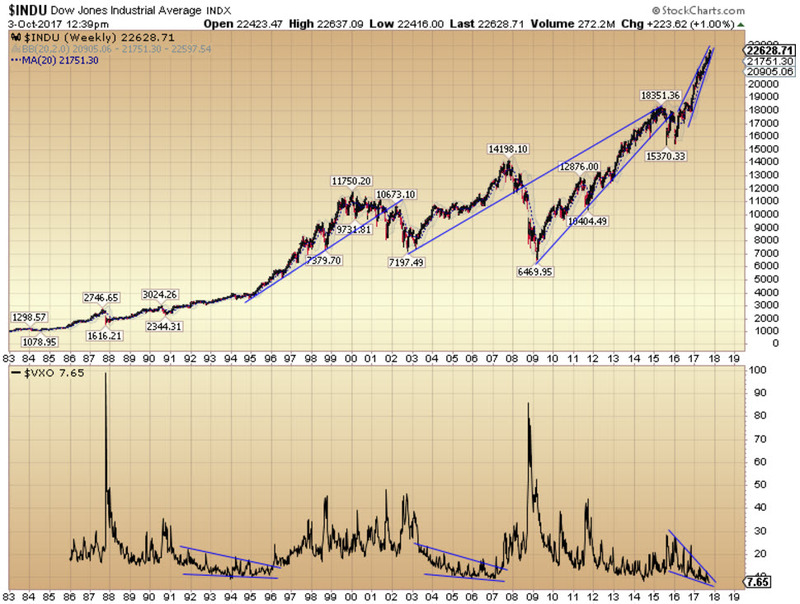 From a technical perspective, we are now at an interesting juncture. Take a look at the chart below. Multi-year support broke for the first time in 2015 but stocks recovered strongly for the remainder of the year. 2016 started with another sharp 15-20% correction before the bulls regained control once again. The DJIA has now rallied all the way back to the major multi-year support trend line and has broken out to new all time highs this week. 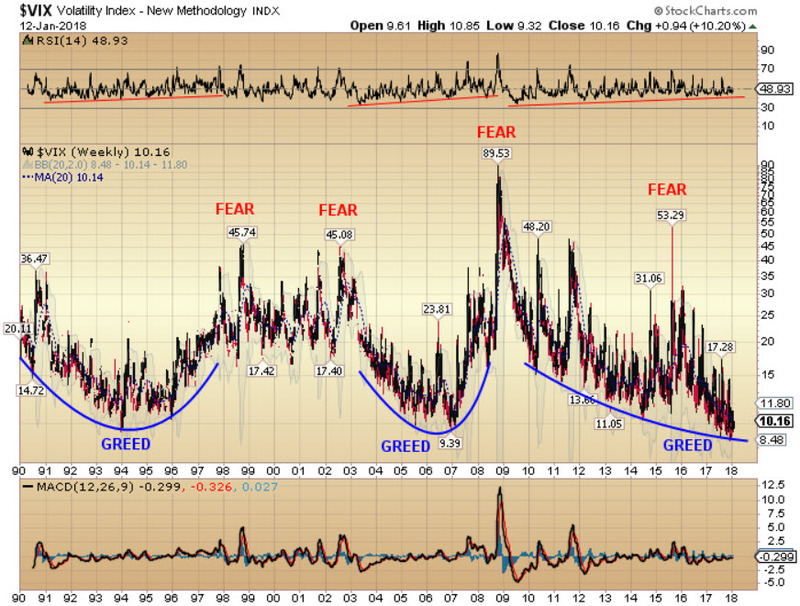 Is this the start of a new multi-month rally or a bull trap? 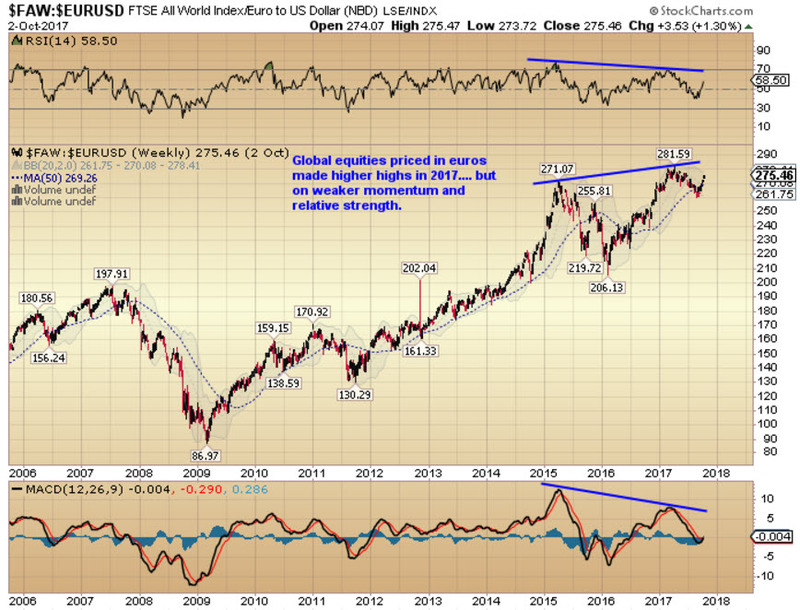 Chartists and traders around the world are watching this setup very closely. We should find out shortly. A similar pattern is unfolding on a shorter time-frame in the S&P 500 - a break of support in October 2016 followed by a sharp rally that has just broken out to new all-time highs. In a world dominated by computer-driven algorithmic trading, these chart patterns matter. When the S&P 500 is trading at a P/E multiple of 25 times earnings and those earnings peaked in 2015 and have been declining ever since, the chart patterns matter even more. The last time US corporate earnings were at current levels was almost 10 years ago, back in 2007 when the S&P 500 was trading at 1,500, -32% lower than today's level. Margin debt, which measures the extent to which investors borrow to invest in the stock market, also looks like it may have peaked. 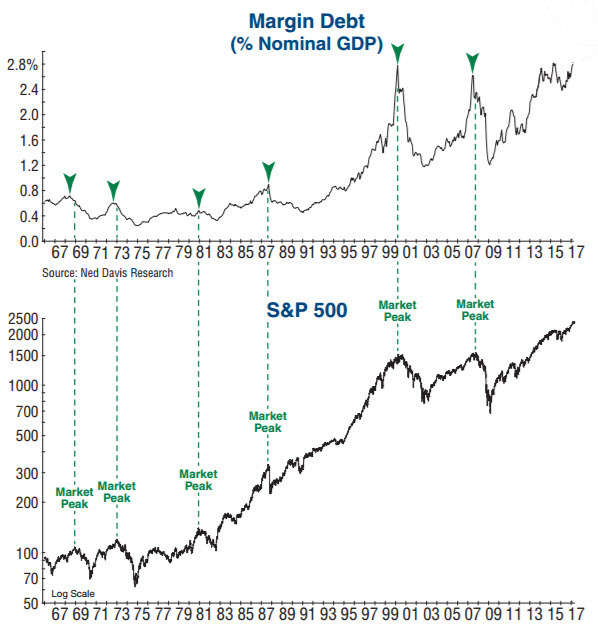 Notice that margin debt as a percentage of GDP peaked at similar levels in 2000 and 2007 coincident with the previous two stock market bubbles. 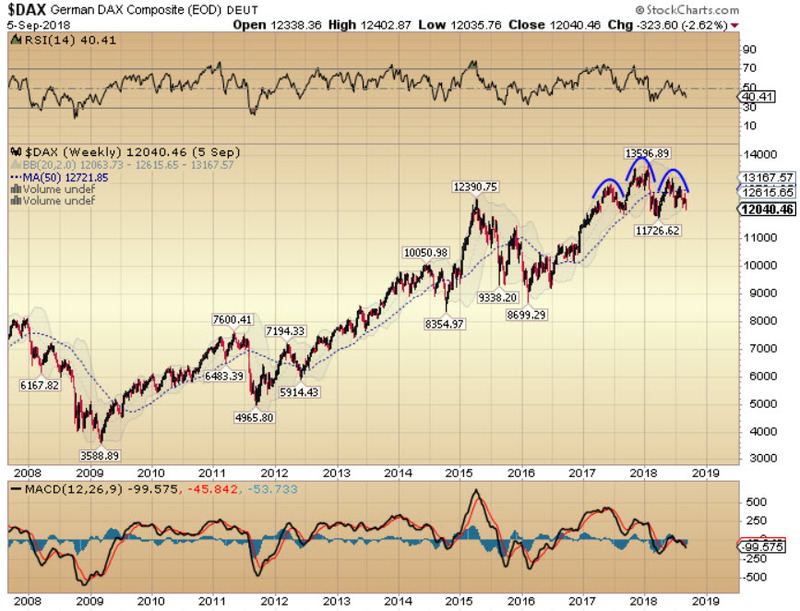 The recent break higher in the stock market has looked convincing and has reversed the sell signal in my technical studies, which triggered in October. Portfolio managers under performance pressure are chasing this move in fear of underperforming benchmarks as we approach the end of the year. I believe the recent breakout will not be sustained and, similar to last year, we will get a sharp reversal at some point between now and March 2017. So I continue to recommend a defensive position in the Active Asset Allocator with an asset mix of 20% global equities / 40% EU bonds / 30% precious metals / 10% cash. 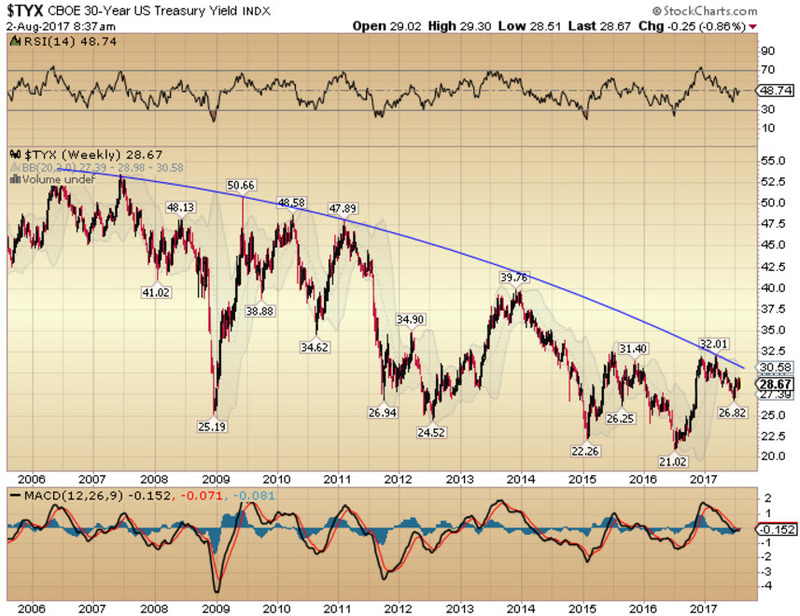 US Treasuries have been hit hardest during the recent correction in government bonds. The 10-year Treasury yield rallied 110 basis points from 1.4% in August to 2.5% today, sending Treasury prices falling over -10%. 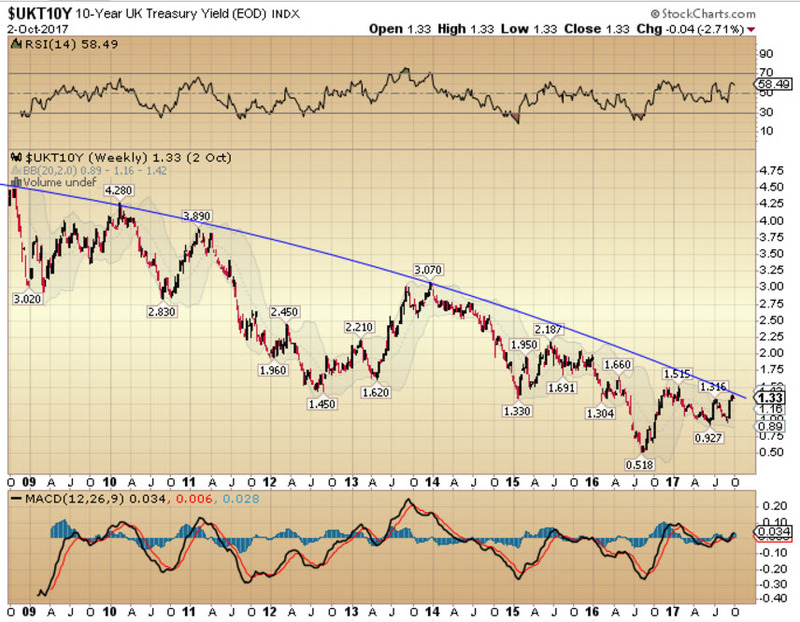 30-year Treasury yields increased 1% from 2.1% to 3.1%, resulting in a capital decline of -15%. 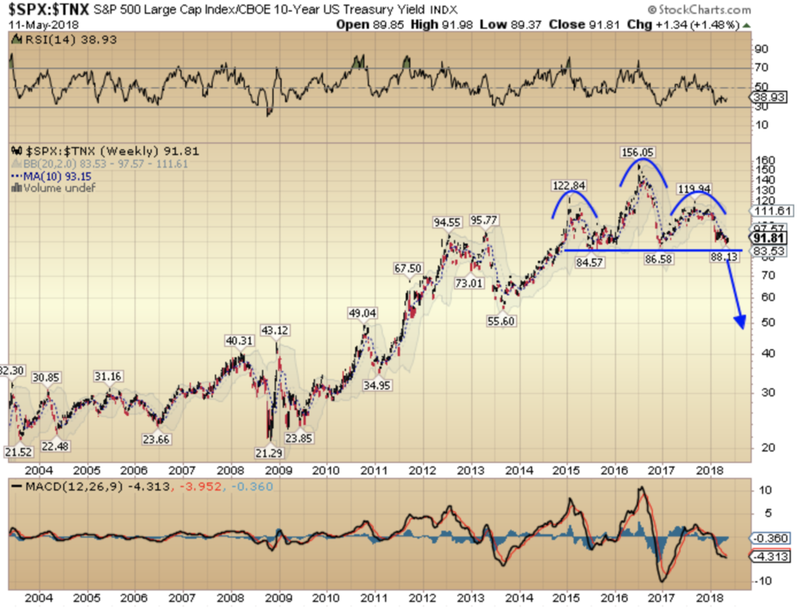 (the Active Asset Allocator strategy has no exposure to US Treasuries). Eurozone government bonds held up better, falling just -4% during the recent Trump-inspired inflation scare (but -7% since August). 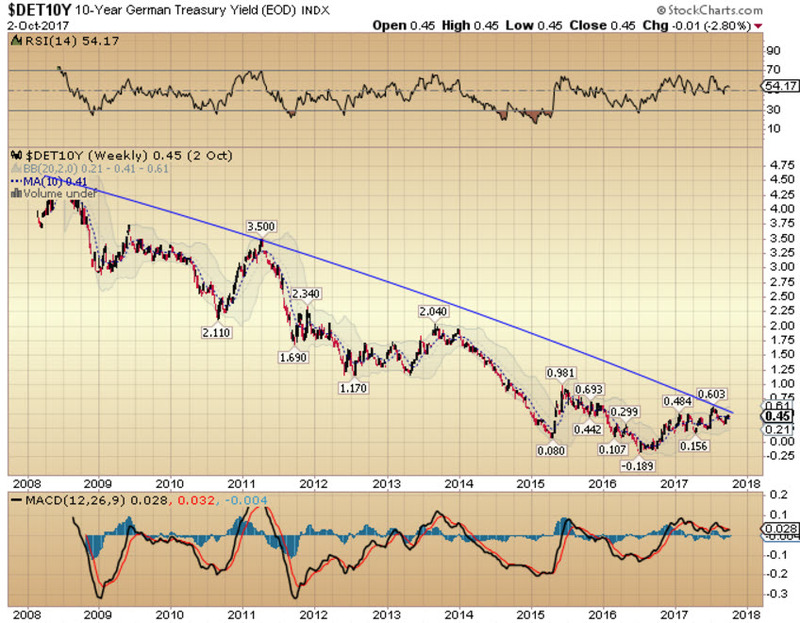 Euro government bonds have now reached an oversold extreme and I expect a rally in EU government bond markets to get underway shortly, likely coinciding with a top in equity markets. 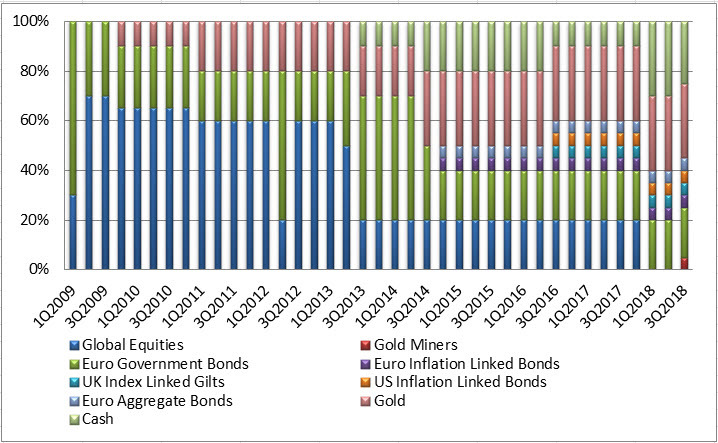 While the Federal Reserve has backed away from its position as lender of last resort, the ECB continues to buy everything not nailed down and has recently extended its QE programme to December 2017. Government debt in the Eurozone continues to grow at a faster rate than GDP. The ECB must hold interest rates below the rate of inflation so that these debts can be serviced and inflated away over time. 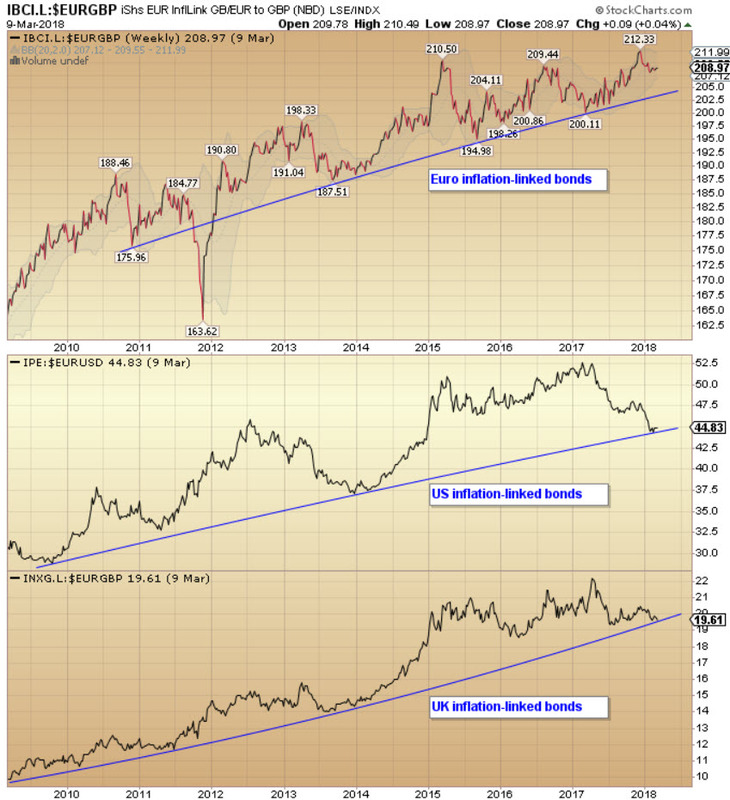 While EU fixed interest rate bonds are approaching the end of their multi-decade bull market, the outlook for Inflation linked bonds (and gold) is brighter. 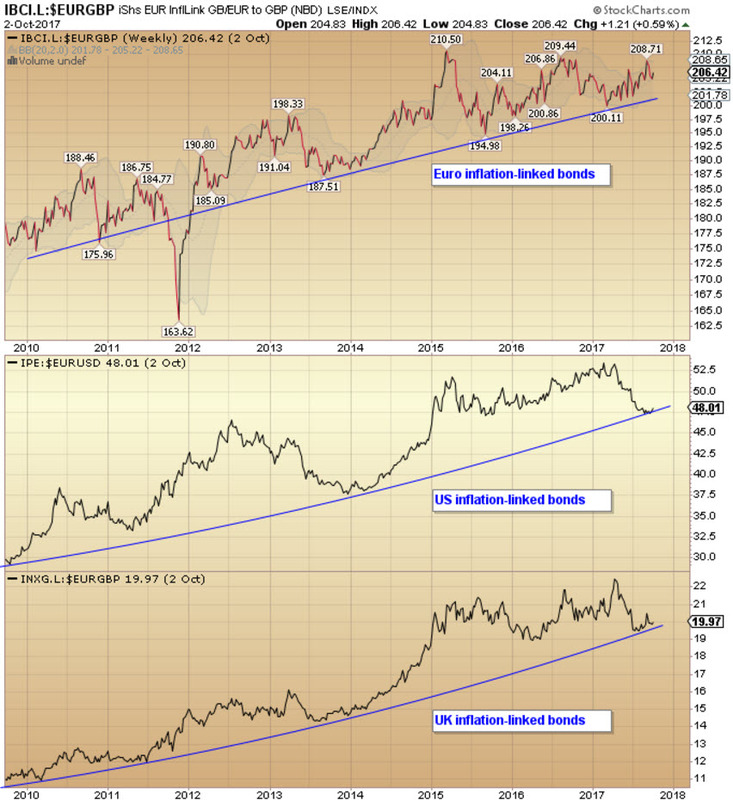 Although fears of deflation continue to reverberate around the world, the echo is starting to fade. We are moving towards an environment of rising inflation. The Active Asset Allocator will continue to transition from fixed interest rate bonds to inflation-linked in 2017. Despite the recent correction, gold priced in euros has still rallied +12% year-to-date. 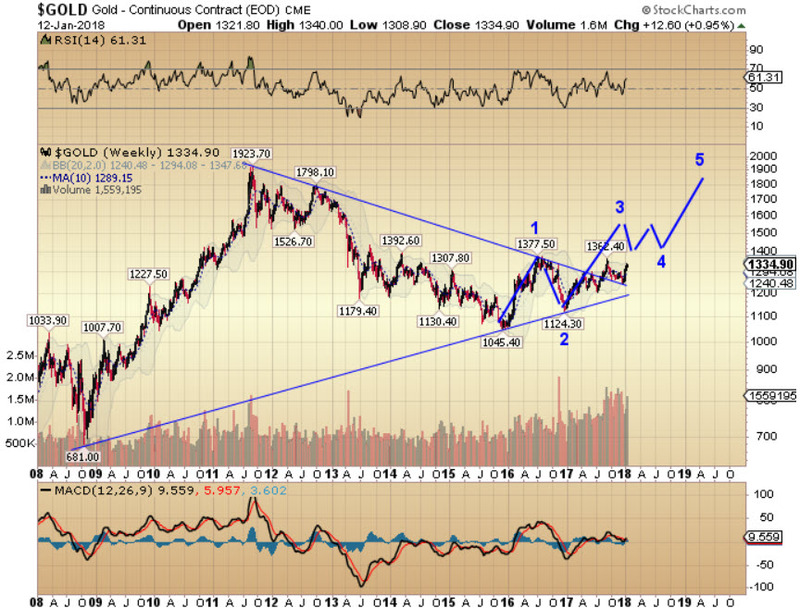 Based on my reading of the gold cycles, we are now getting very close to the end of the current investor cycle for gold and I expect a turn higher shortly, possibly coinciding with an interest rate hike by the Federal Reserve on December 14th. The Federal Reserve last raised interest rates a year ago on December 16th 2015. Gold closed at $1,071 that day. In a shakeout move, gold dropped $20 the following day before then shooting higher by +30% over the next 6 months. I expect something similar this time round. Also, inflation wasn't a concern for the Fed last year but with Trump in the White House in January 2017, the narrative is changing. Another difference between then and now is that USD gold looks to be making a higher low for the first time since 2011. 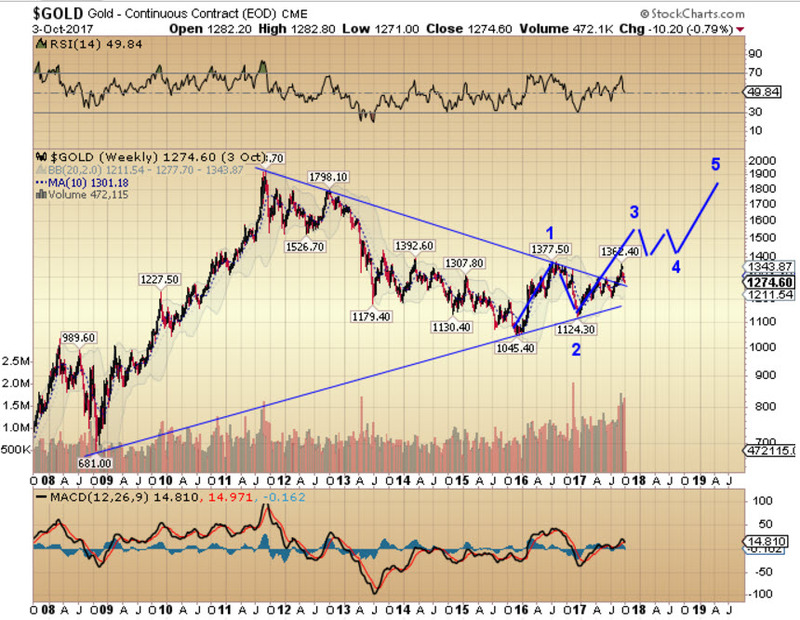 A higher low is bull market action and will confirm a change of character for the gold market. If gold can form a low in the $1,100's, the next target will be a higher high in 2017 above $1,378. I think we will get it. 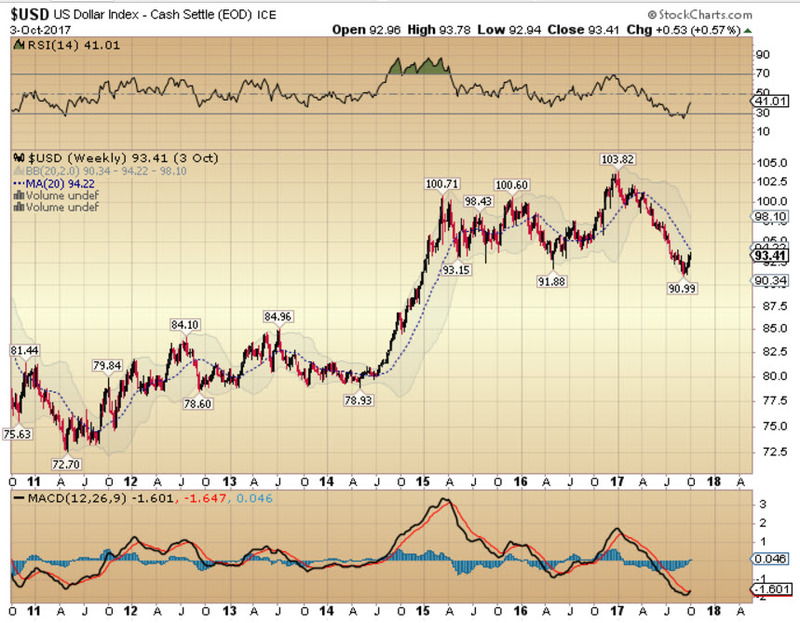 A higher low followed by a higher high will get more involved in the precious metals market, a necessary development to drive gold prices higher. Gold priced in euros has been holding up reasonably well since June 2016. Euro gold has not made a lower low despite the +7% rally in the USD over the same period. The time has come for gold to show its hand. 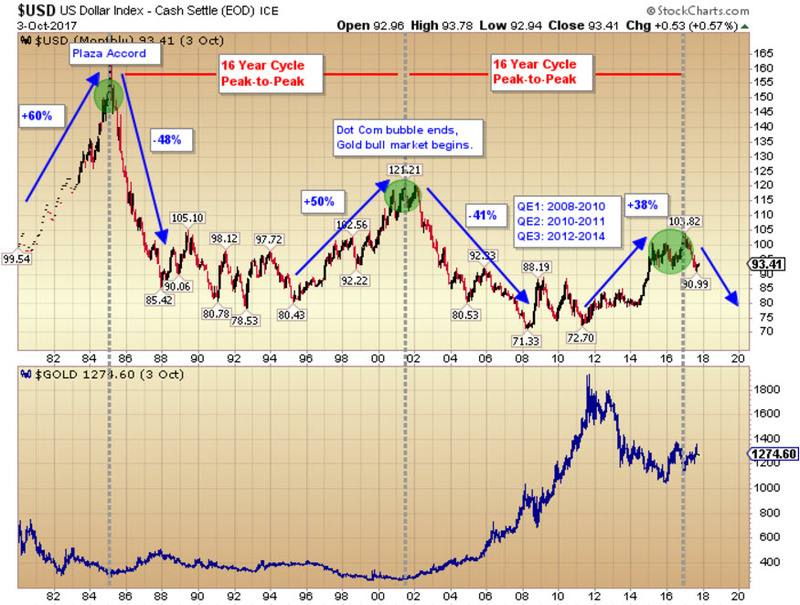 If the bull market is back, gold should rally sharply over the next 6 months. If gold disappoints, something else is at hand and I will cut back exposure in the Active Asset Allocator. Despite expensive valuations, stock markets remain well bid and my technical trend indicator remains on a 'BUY'. 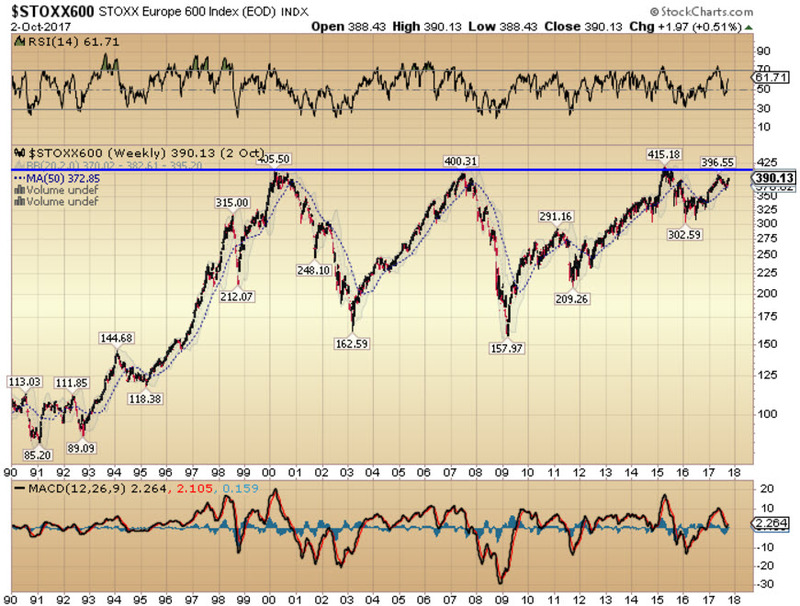 In the short-term, equities are overbought and due for a pause or correction. If the bullish technical setup persists as we navigate past the seasonally difficult August to October period, I will add equity exposure to the Active Asset Allocator. For now, I remain patiently in defensive mode. I also am planning to tilt the regional equity exposure away from the US towards Europe, where stock market valuations are more compelling. Stay tuned. This month, I added 5% to UK index linked gilts and 5% to US inflation linked bonds in the Active Asset Allocator, lowering the cash position from 20% to 10%. 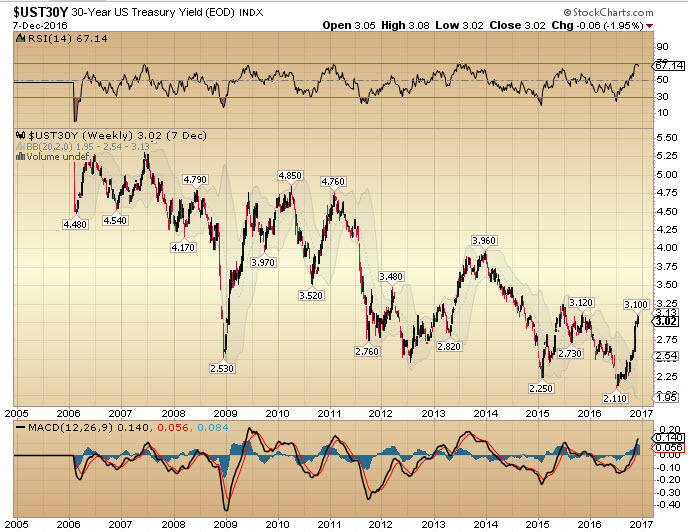 The bond market is pricing in almost no inflation in our future and I believe that is a mistake. 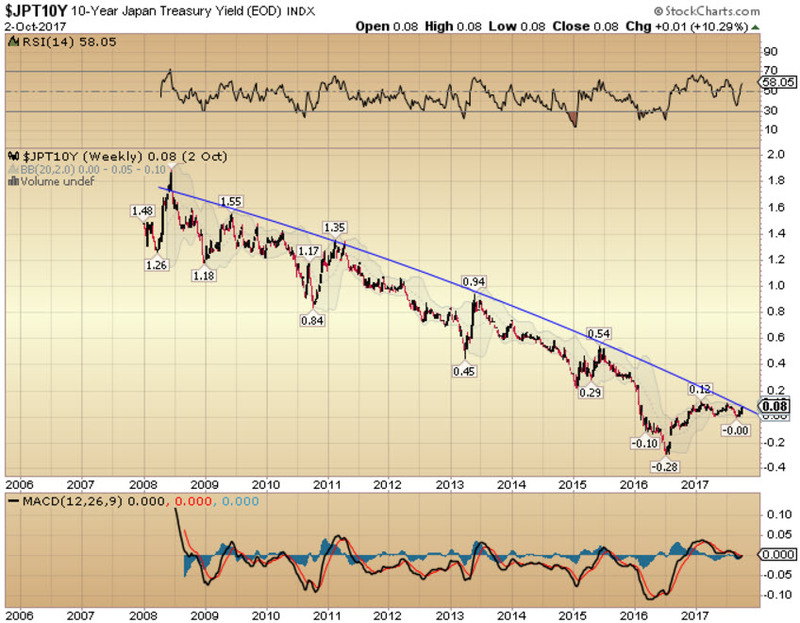 The Active Asset Allocator continues to hold a 20% allocation to fixed interest rate bonds but the clock is ticking on this trade and I have one eye on the exit door. On precious metals, the World Gold Council published its Q2 2016 update on Gold Demand Trends and noted a +141% year/year increase in investment demand. it's a bull market folks. I also closed out Trade 7 for Gold Trader on Friday at breakeven. I remain defensively positioned for now with 20% equities / 40% bonds / 30% precious metals / 10% cash. My technical studies triggered a buy signal for the stock market on 15th April 2016 and it remains in place today. Since this trigger, global stock markets have rallied +4% in aggregate. 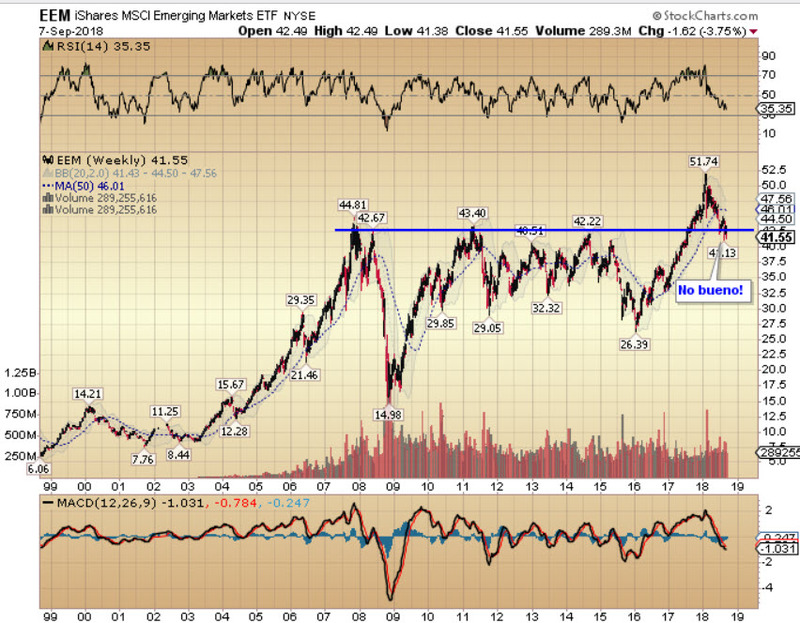 US equities have gained +4%, European stocks are unchanged while emerging market equities have added +8%. (EU bonds and gold have also rallied over the same period with bonds +4% and gold +9%). 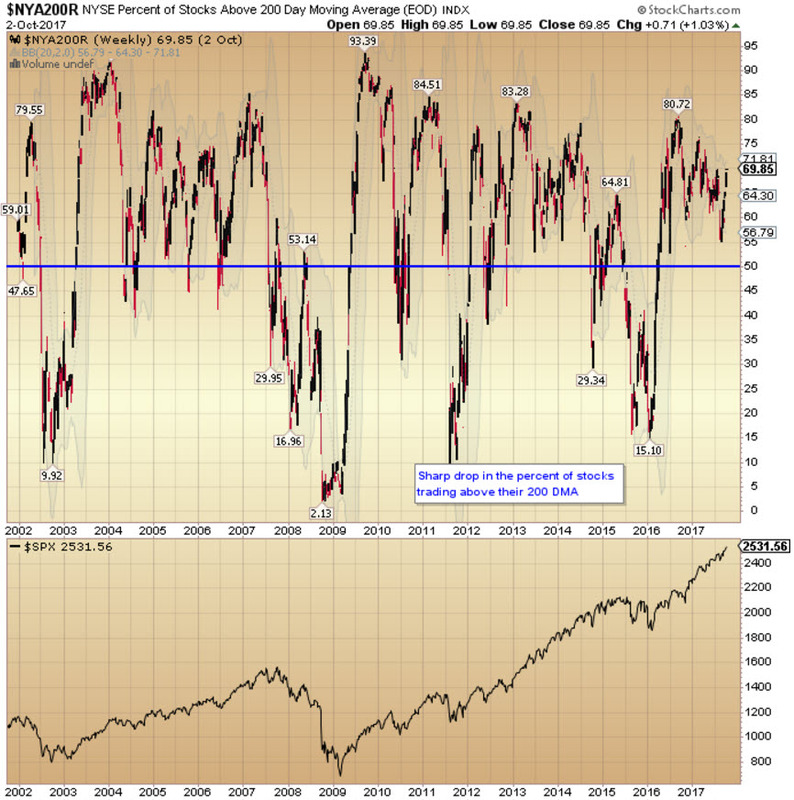 I have been reluctant to follow the buy signal for equities to date, largely due to valuation concerns. Today, the S&P 500 trades at 25 times reported earnings. The S&P 500 has traded at a valuation above 24 times reported earnings only 9% of the time since 1928. If we exclude the tech bubble and 2008 financial crisis, when corporate earnings all but disappeared, that number drops to just 2%! We are also entering the historically difficult August to October period where stock markets have suffered significant declines in the past. 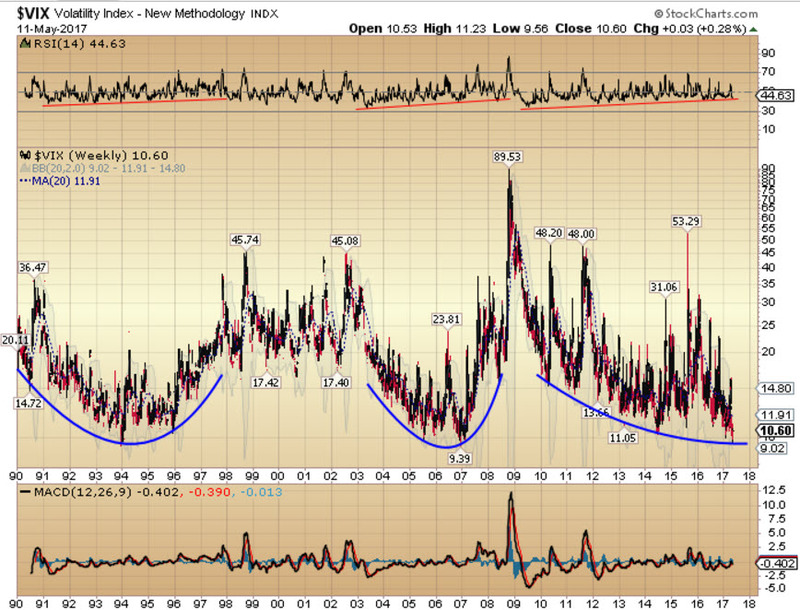 However, despite expensive valuations, the market's technical picture has recently improved. 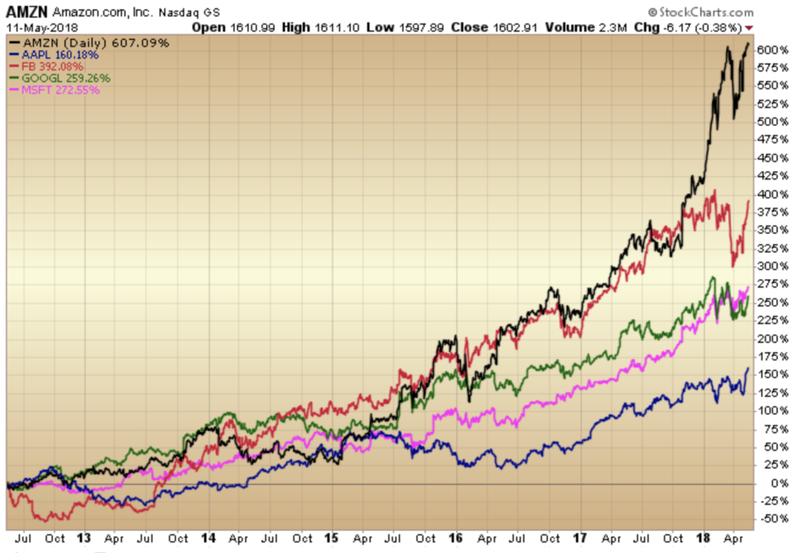 The number of stocks making new lows has evaporated while the number of stocks breaking out to new highs continues to increase (lower left chart). 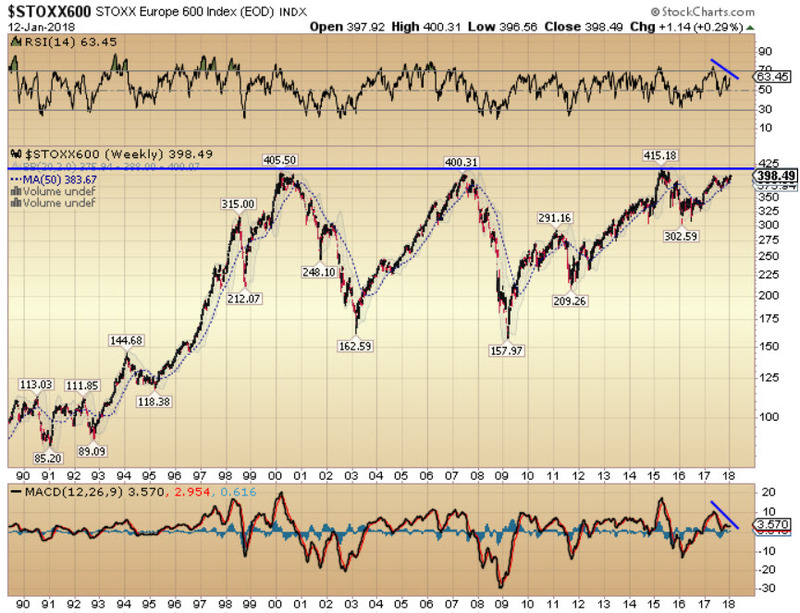 This is a prerequisite for another leg higher to develop in what is a maturing equity bull market. Central banks around the world continue to add fuel to the fire with the Bank of Japan, ECB, Swiss National Bank and People's Bank of China being particularly active in 2016 YTD (lower right chart). The next chart is quite revealing and one to which I am paying close attention. It shows the performance of consumer cyclical versus consumer staple stocks. Consumer cyclical stocks rely heavily on the business cycle and include industries such as retail, automotive, housing and entertainment. Consumer staples tend to perform better during recessionary periods and include non-cyclical industries such as food, telecom, utilities and healthcare. So when the trend is rising, Cyclicals are outperforming Staples, and stock markets tend to do quite well. When the trend reverses and Staples outperform Cyclicals, markets tend to struggle. 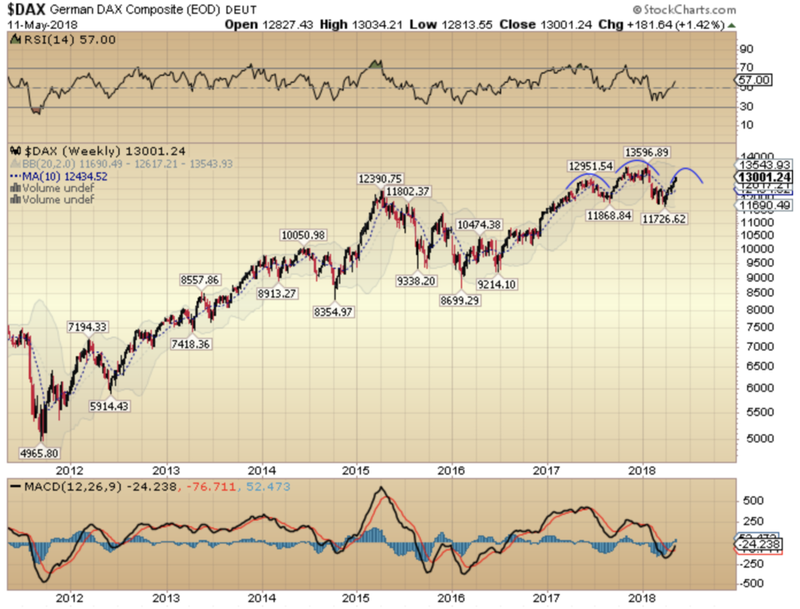 The chart took a sharp decline in late 2015 signalling that all was not well for stock markets and true to form, they have struggled so far in 2016. However, Consumer Cyclicals have started to show some relative strength in recent months and may be about to break out above the down-trending 50WMA. 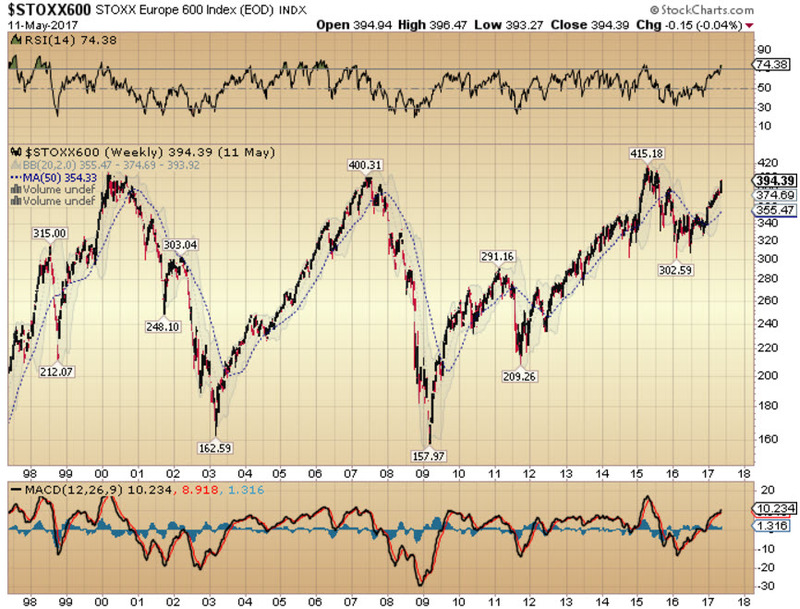 This would be quite a bullish development and allow me to become more constructive on the outlook for equities. In another positive development, a significant 78% of stocks on the NYSE are now trading above their long-term 200DMA, signifying broad participation in this recent stock market rally. 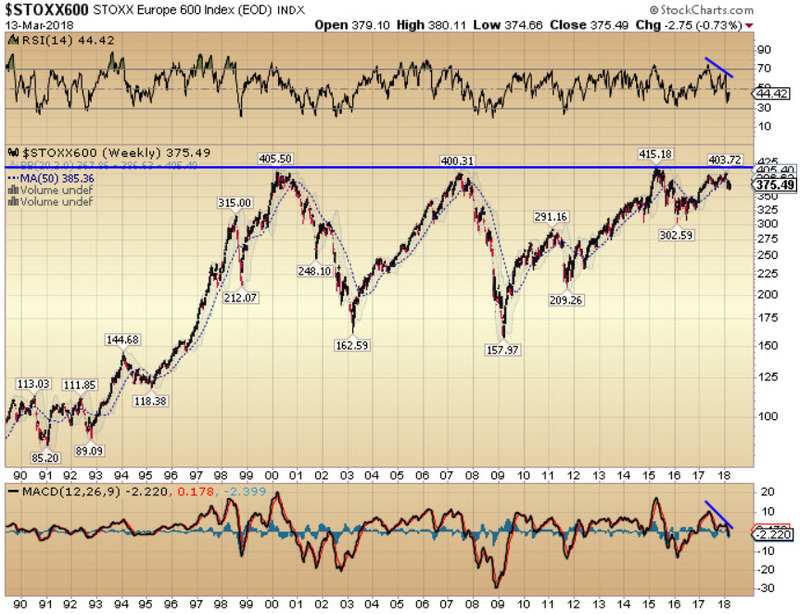 In the short-term, equities are overbought and due for a pause or correction. If stock markets can hold firm over the next couple of months and my technical studies remain favourable, I will increase the equity allocation in the Active Asset Allocator. I also am planning to tilt the regional equity exposure away from the US towards Europe, where stock market valuations are more compelling. Stay tuned. 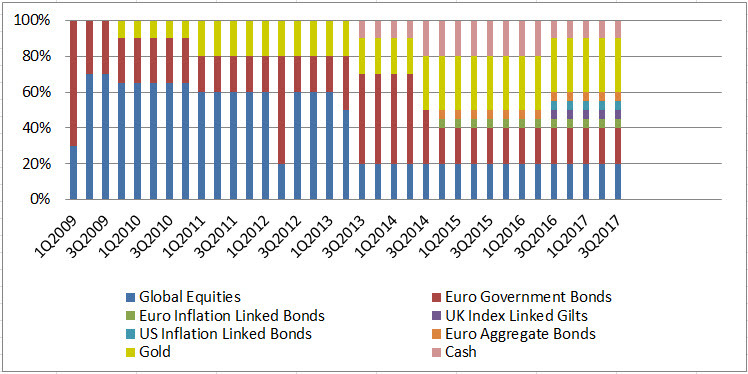 This month, I added a 5% allocation to UK index linked gilts and a 5% allocation to US inflation linked bonds, lowering the cash position in the Active Asset Allocator from 20% to 10% to fund the purchases. 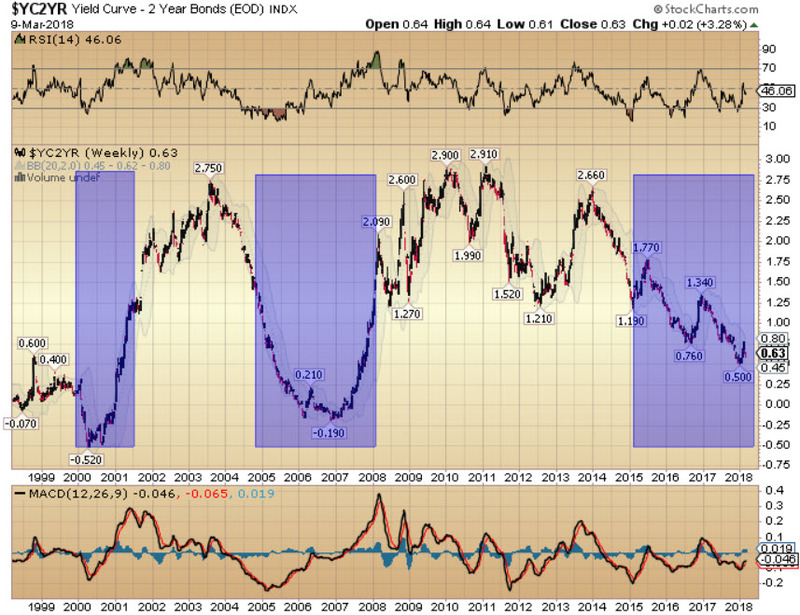 The bond market is pricing in almost no inflation in our future and I believe that is a mistake. 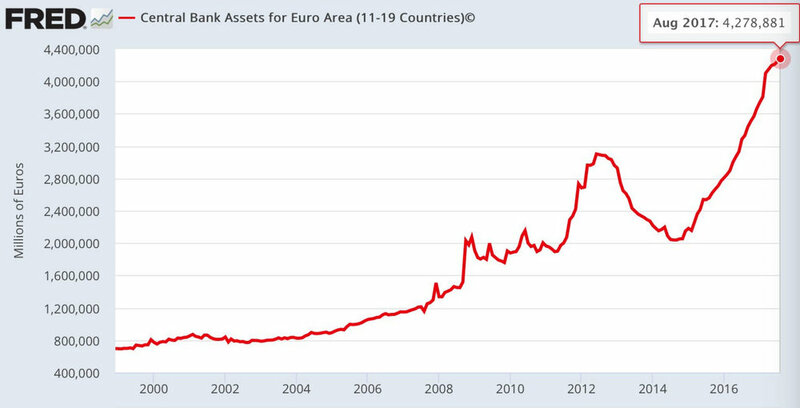 Printing money always leads to inflation, eventually. We have experienced 7 years of asset price inflation (rising equity and property prices) and are starting to see increasing signs of wage inflation this year. 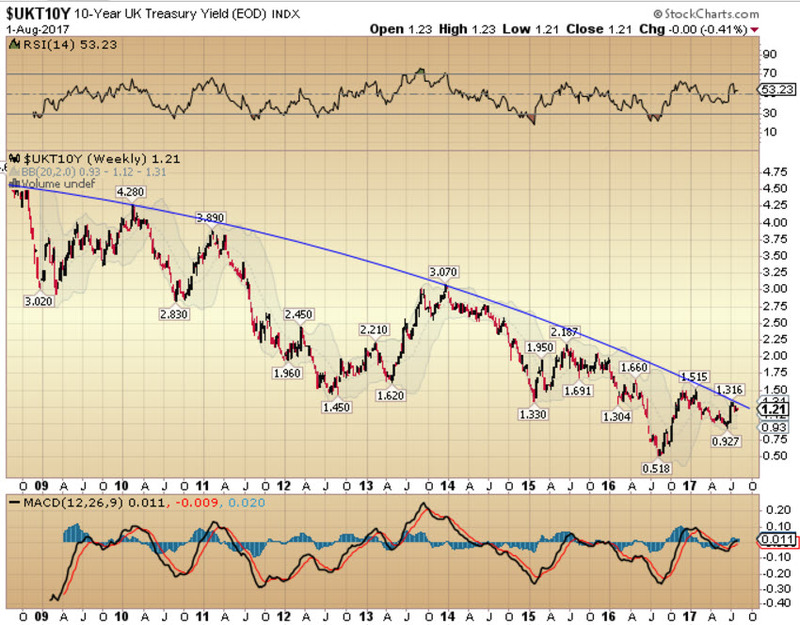 In the United States, while inflation linked bonds continue to underperform Treasuries, technical signs of a change in trend are at hand. 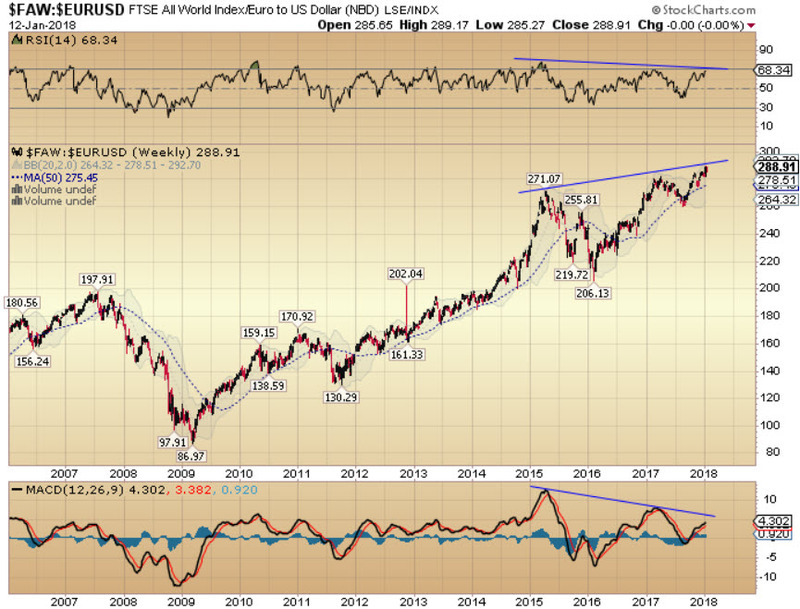 Relative strength (RSI) and momentum (MACD) indicators are improving in favour of inflation-linked bonds and price should follow suit later this year. Central banks have already driven government bond yields to zero or below and are now examining alternative ways to distribute a continuing flow of newly printed money. Accelerated fiscal spending and/or direct payouts to the public (helicopter money) are potentially on the cards. Trends in wage inflation have also started to rise in the US recently. 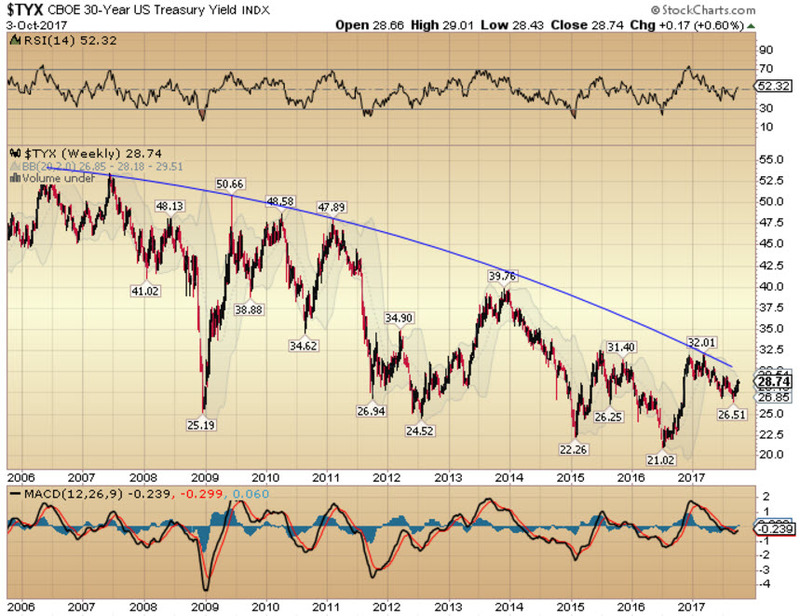 I expect the bond market to start pricing in a more inflationary outlook and inflation linked bonds should be a beneficiary. 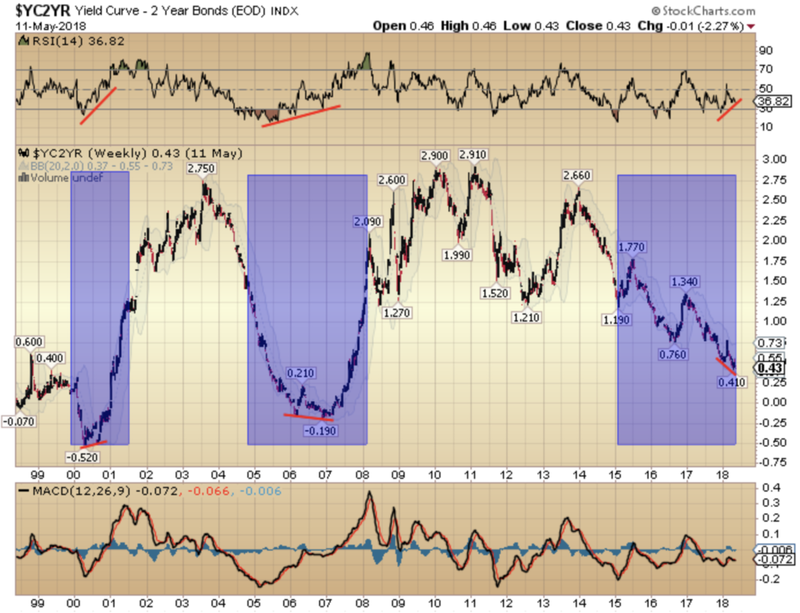 The 35+year bull market in fixed interest rate (rather than inflation-linked) bonds is in its final innings. We could be entering the final blow-off phase, which, when it ends, will unleash pain and chaos across multiple asset markets, but we are not there yet. Rising bond yields, when they do come, will lead to significantly lower prices for long duration fixed interest bonds and equities alike. (Stocks are simply a claim on a future stream of cash flows, discounted at the prevailing market rate. When that interest rate goes up, the present value of a stream of cash flows declines. it is simple mathematics). 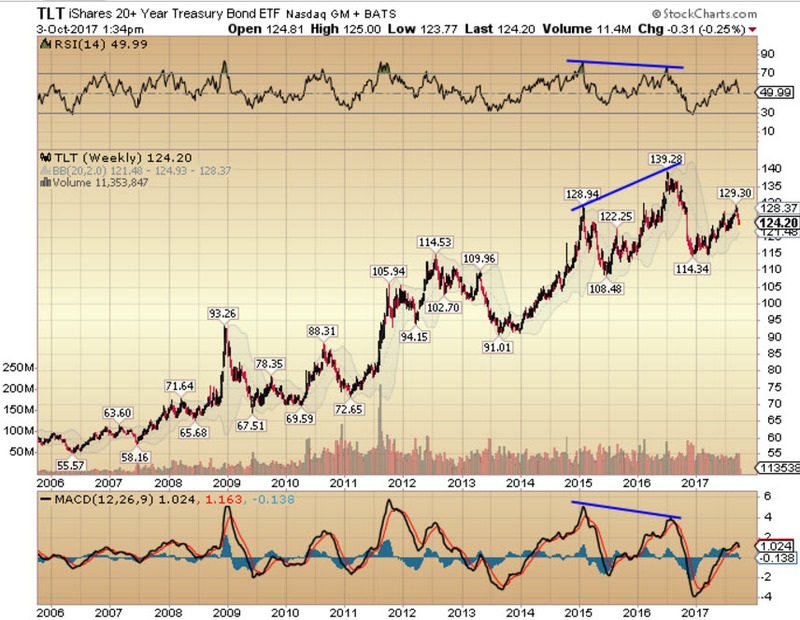 The Active Asset Allocator continues to hold a 20% allocation in fixed interest rate bonds but the clock is ticking on this trade and I have one eye on the exit door. The World Gold Council has published its quarterly report on gold demand trends for Q2 2016 with some interesting highlights. The report details a 15% increase in overall gold demand year/year driven by a +141% increase in investment demand. The main buyers continue to come from India and China, though US investor demand is also on the rise. Gold supply increased +10% with total mine supply +5% year/year. The increasing appetite for gold is evident in the next chart where you can see that gold is rising at a faster rate than either of the prior two times when gold broke out above its long-term 20-month MA. Investors want in and are increasingly happy to pay higher prices to get their bullion. 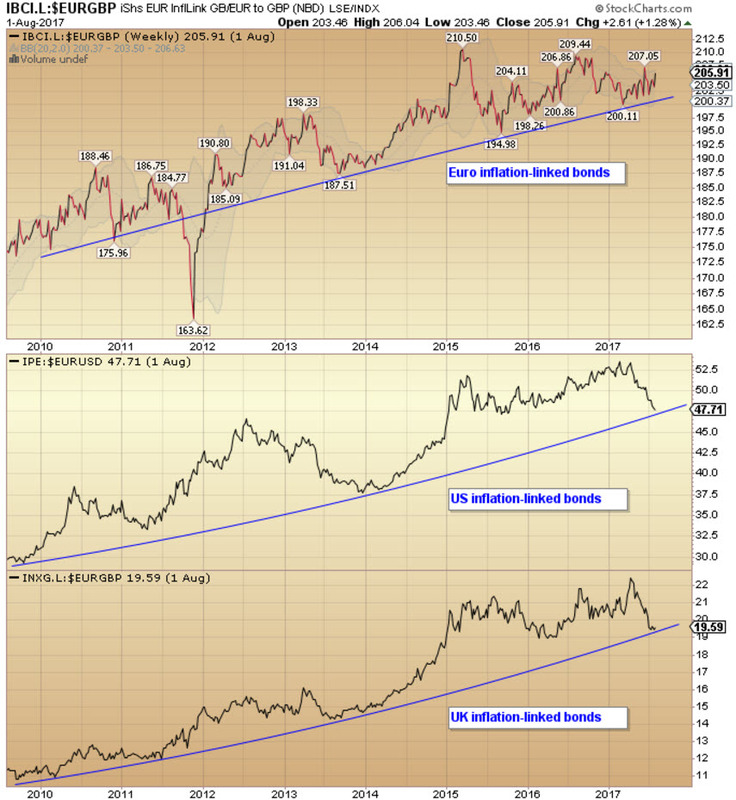 Gold outperformed stocks from 2000 to 2011 before entering a bear market that ended last year. 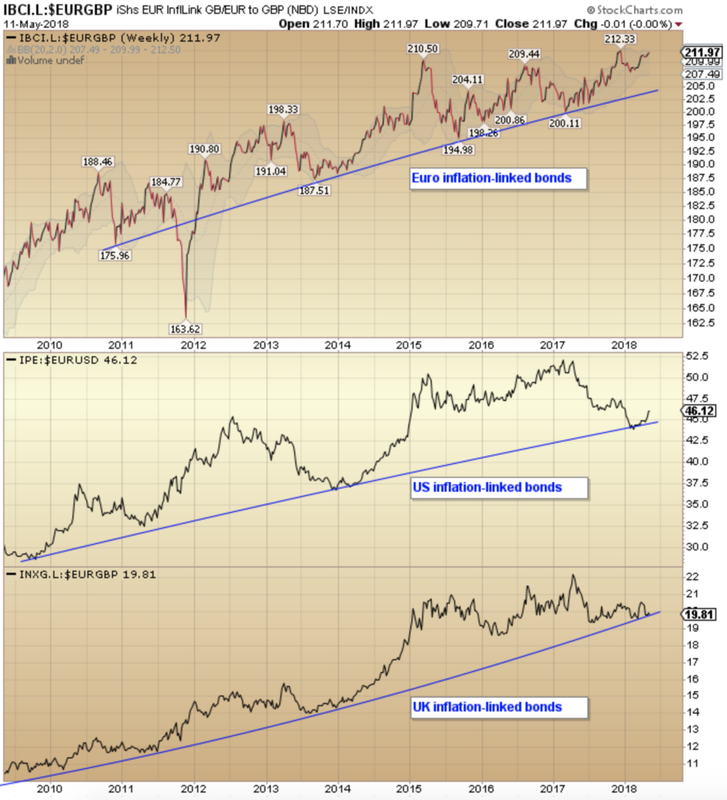 Gold has started to outperform the S&P 500 once again this year, a trend that I expect will remain in force for at least the next 2-3 years and perhaps quite a bit longer. The gold miners are leveraged plays on the price of gold. The index of gold and silver miners has already rallied +192% since the low made on 19th January 2016. The miners are a notoriously volatile sector of the market but for those with patience and an iron stomach, fortunes will be made in this sector before the bull market ends.